Njenga, a professor of virology and global health, is the country director for WSU Global Health-Kenya. He is based in Kenya on the health sciences campus of the University of Nairobi. A member of Allen School faculty since 2015, Njenga’s clinical training is in veterinary medicine with advanced training and research in emerging infectious diseases. 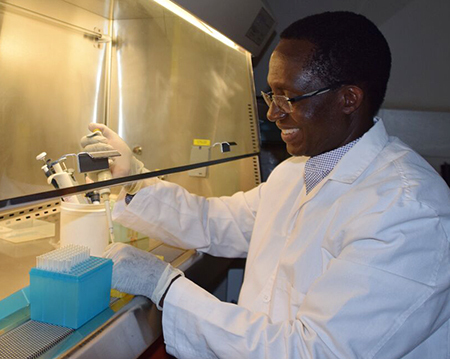 Kariuki Njenga, WSU professor of virology and global health in Kenya, working in his lab. The president also noted the significance of Njenga’s achievement for the university. “Our faculty are involved in life-changing research that addresses world challenges. This achievement is additional evidence of their impact, and it advances our goal of being recognized as a top 25 public research university by 2030,” he said. Njenga is the eleventh WSU faculty member elected to the National Academies and the third from the Allen School to receive the honor, joining Guy Palmer and Terry McElwain in the National Academy of Medicine (NAM). Palmer, a WSU Regents Professor and senior director of global health, was elected in 2006, and Terry McElwain, a WSU Regents Professor emeritus, was elected in 2009. NAM announced the election of 80 new members today during its annual meeting in Washington, D.C. Election to the NAM is considered one of the highest honors in the fields of health and medicine and recognizes individuals who have demonstrated outstanding professional achievement and commitment to service. WSU, the University of California, and the University of Pennsylvania are the most highly represented colleges of veterinary medicine in the NAM. Njenga’s primary responsibilities include enhancing the collaboration between human and animal health experts in Kenya. Leading WSU’s program supported by the Centers for Disease Control and Prevention (CDC), he focuses on enhancing the capability for disease surveillance and outbreak management for infectious diseases, including viruses such as Ebola and Zika. Prior to joining WSU, Njenga headed CDC’s One Health in Kenya from 2009-2014. There he led the establishment of the first Zoonosis Disease Unit in Kenya, worked with the central government to complete a five-year strategic plan to implement One Health in the country, and identified funding to support the training of veterinarians and physicians in Kenya’s Field Epidemiology and Laboratory Training Program. Njenga has published widely in academic journals about infectious diseases, received nearly four dozen research grants from sources such as the CDC, the U.S. state department and Department of Defense, and presented his research at scientific meetings worldwide. He has mentored three dozen graduate students pursuing advanced degrees in health, science, and medicine. Njenga earned bachelor’s and master’s degrees at the University of Nairobi and a doctorate at Penn State University. He completed a postdoctoral fellowship at the Mayo Clinic and Foundation in Rochester, Minn. The Paul G. Allen School for Global Animal Health, was founded in 2007 to address global infectious disease challenges at the animal-human interface. Last year the school received a five-year, $20 million-plus award from the CDC to conduct infectious disease research in Kenya. The research is focused on emerging diseases, including the Zika virus, zoonotic diseases, and antimicrobial resistance. The Allen School is also working with the World Health Organization, the CDC, and other partners to eliminate rabies — which kills nearly 60,000 people annually — as a human health threat. WSU has concentrated its efforts in Africa, where the university and its partners have vaccinated more than one million dogs since the program’s inception in 2003.